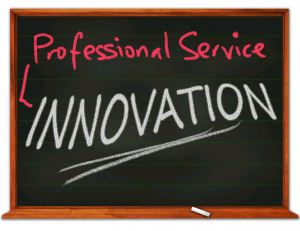 This is the fourth of a series of seven articles on professional service innovation. The objective of the series is to provide a basic introduction to innovation management for managers, partners and change agents working in professional service firms. This article discusses the opportunities for applying innovation to reduce the cost of operating internal support processes and external processes (i.e. services). To read the first article in the series go here. Processes and services are the most common opportunity areas for innovation in professional services firms (see reference study here). Business processes are the way work gets done in an organization and services deliver value to clients using internal and external processes. Therefore there are major opportunities for innovation in these areas. Of course process innovation has a long history from the industrial world, emanating in work study and Taylorism in the early 20th century and being re-energised by the emergence of Lean thinking (based on the Toyota Production System) in the mid-1980s and Business Process Re-engineering in the early 1990s. Some would call such process innovation ‘business improvement’ rather than innovation. I find it more effective to consider this as part of an innovation programme – as it meets the criteria of innovation, i.e. converting ideas to value (e.g. improved efficiency). By including process innovation as part of the firm’s innovation programme, common resources and management methods can be applied. In my work with professional service firms (particularly law firms) over the last decade on such process innovation, clients have achieved reductions in the direct costs of performing services of between 25-50% (and as high as 75% on one occasion). This level of cost reduction enables a firm to significantly improve its competitiveness. However, there is a challenge. If existing services are charged on an hourly-rate basis, then all the efficiency benefits will be given to clients, either as less hours required per matter and/or lower hourly charges. To avoid this and enable a firm to determine how much to keep (as increased margins) and how much to give away (as price reductions), it needs to introduce fixed fees for the service. This is typically welcomed by clients as improving price certainty at a time of increased budget pressures. But firms then need to apply new disciplines for delivery management to ensure that fee earners can work to the required cost targets to ensure profitability targets for services are met. Office costs – through reduction in footage costs (lower cost location) or less footage needed (‘hot-desking’ and mobile working). Purchasing of external services and materials – through good procurement practices and effective commodity management, which have often been weak in professional services in comparison to industry. Support costs (e.g. IT) – through internal efficiency improvements (using process analysis) or outsourcing. Overall, professional service firms need to reduce the share of their overheads taken by office costs and increase the share taken by IT. The latter is increasingly core to the effective and efficient delivery of professional services, the former is not. In the next article I will show how firms can utilize innovation to increase the value provided to clients through enhanced or new services. This is the third of a series of seven articles on professional service innovation. The objective of the series is to provide a basic introduction to innovation management for managers, partners and change agents working in professional service firms. 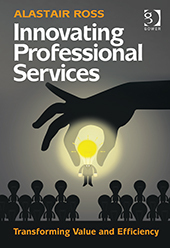 This article outlines a systematic approach to enable, direct and manage innovation within a professional services firm. To read the first article in the series go here. Leadership – Active support and encouragement from the top is key to establishing a supportive environment for innovation and also to focus the firm’s innovation efforts. 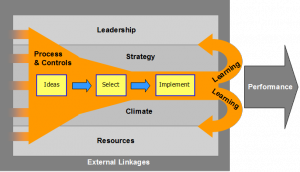 Strategy – A clear strategy is needed to provide context and priorities for innovation. The strategy will define where the firm will focus its innovation efforts with targets and supporting metrics. Process – A structured and objective ideas management process is required to explore, select and implement the best ideas. This helps ensure that the firm focuses its limited resources on the best ideas, rather than ‘pet projects’. Climate – A supportive culture and values are needed to establish an environment that promotes innovative behaviours. Key metrics in professional service firms, such as chargeable-time utilization, need to be complemented with other metrics that support innovation. Such metrics encourage employees and partners to make time for innovation and take the risk of proposing and championing new ideas. Resources – People time, methods and money are needed to fuel innovation. In a professional services firm, making time available for fee earners to develop promising ideas is critical – as is recognizing and rewarding those who deliver innovation. External Linkages – Effective links to the outside world, especially clients, for ideas and resources, is important for ensuring that the firm is focusing on market-relevant ideas. Engaging clients in innovation co-development also increases the likelihood of success and strengthens client relationships. Learning – Capturing and sharing learning from innovation across the firm is key to increasing return from innovation activities – looking to where else a similar innovation can be applied and encouraging the ‘re-use’ of ideas. 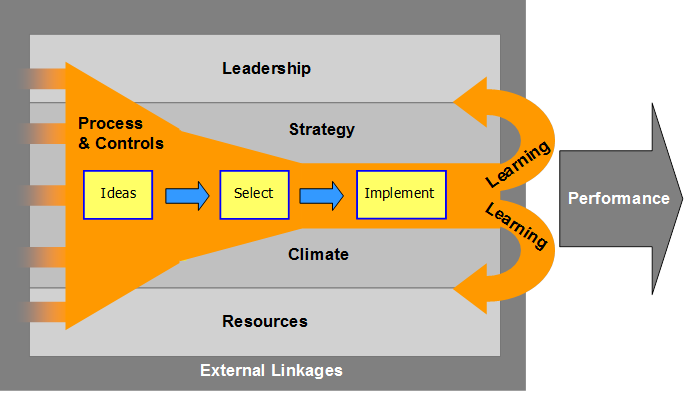 Process-based learning and improvement is also a competency that is fundamental to enabling continuous improvement, but is typically lacking in professional service firms (for more information on applying Knowledge Management to process improvement, see here). To help firms in establishing and developing their innovation system, Codexx uses an assessment approach called ‘Foundations for Innovation’ (F4i for short) that reviews 60 key practices that make up the 7 areas of the innovation system. Codexx has used F4i with law firms, insurance companies, business consultancies as well as industrial organisations. But as an initial start you can simply consider how effectively your firm supports innovation across the 7 areas defined above and what improvements are needed. The overall innovation system will only be as strong as its weakest link. I have worked with professional service firms who established innovation processes, defined an innovation strategy and dedicated some personnel time for innovation, but the lack of a supportive innovation climate (non-chargeable time was not valued or rewarded) and indifferent leadership (other than a couple of partner champions, the board was lukewarm in support) meant that few ideas were generated to go into the innovation process and even fewer were progressed along it. A firm’s management needs to be committed to innovation if it is to establish a supportive system that enables effective and sustained innovation – rather than an occasional ‘get lucky’ approach. In the next article I will show how firms can utilize innovation to reduce the costs of their business processes. You are currently browsing the Codexx blog archives for October, 2015.